By 2001, Dave had found his passion in the door and window aspect of his remodel business. He consolidated all operations to specialize in the door and window industry. Dave established a successful window replacement company called HomeFront Windows with two beautiful retail showrooms in Orange County installing thousands of windows. 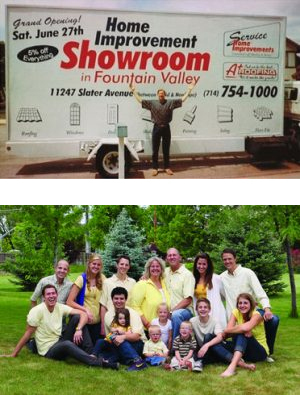 In 2007, Dave sold this business to relocate his family to Utah. Dave now owns and operates HomeStar Windows and Doors based in Sandy, Utah. He believes this is his best business model ever. HomeStar is designed to cater to today’s tougher economic conditions by offering the guaranteed lowest price in Utah for quality replacement windows. Dave is able to do this by dealing directly with his customers; doing most of the quoting and supervision himself to keep his overhead and prices low. He is committed to provide the most personalized and professional service available. HomeStar offers a unique warranty package, beyond the manufacturer’s warranty protection, including lifetime warranties for screens (Milgard windows only), glass breakage, and caulking. Dave believes that one of the most important keys to a successful remodel business is “doing what you say you are going to do when you say you are going to do it.” He has partnered with Milgard Windows due to their integrity in honoring warranties and their commitment to quality made windows. Milgard is a top rated, award winning, national brand, with a 50-year history of providing cutting edge, innovative products to the window industry. Dave is committed to a written code of honor that governs all aspects of his business dealings. He loves being personally involved in every project to ensure that customers receive excellent service. Dave lives in Highland where he enjoys hiking, fishing and spending time with his wife, children and grandchildren.